Patty's Utopia: I Am a Pike Place Market Bell Ringer! 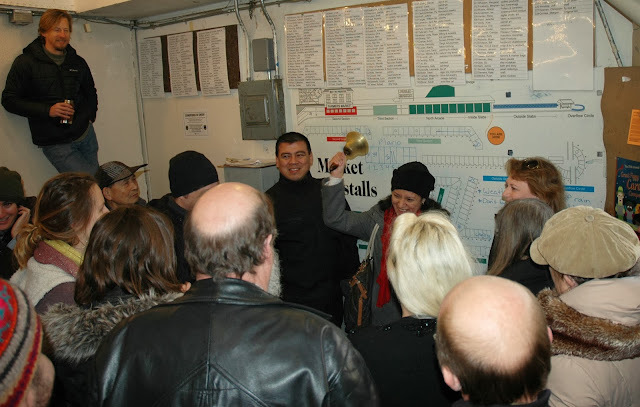 I Am a Pike Place Market Bell Ringer! 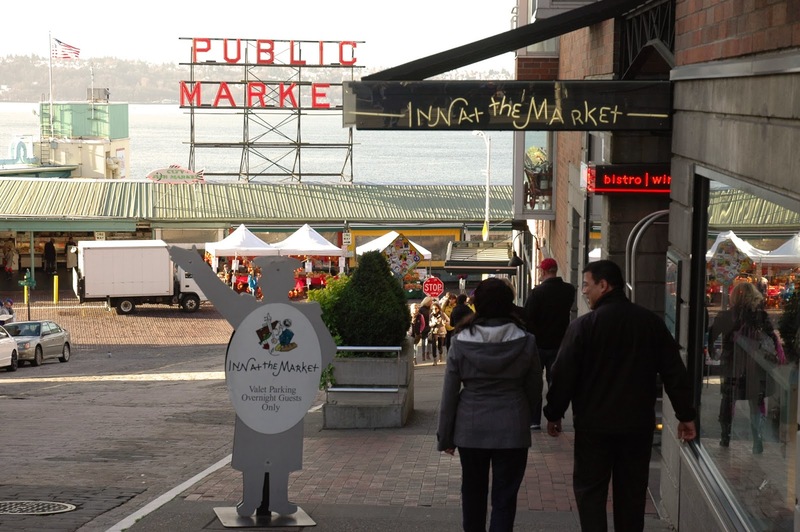 And what's so exciting about ringing a bell at the Pike Place Market? And where is such bell? About a month ago, my dear friend and famous Radio DJ Lori Ness, asked whether my husband Miguel, and I would be interested in ringing the bell to start the day at the Pike Place Market. The "Roll Call Bell" is rung each morning at 9am, and it essentially calls out to the community to let them know that roll call is beginning, and to be ready to choose their market space for the day. Because no one has a fixed place, their spot changes every day. She explained that this is a tradition that they have been following for the past 40 years, and they usually have leaders or celebrities of the community doing it. So, we obviously said yes! It was an honor to be asked to do this! When we arrived to the market early in the morning on a cold Saturday, we were welcomed by Pam Corwin who represents the Pike Place Producers, a group of professional craftspeople and artists of Seattle's historic Pike Place Market. She explained to us that the group was formed to create opportunities for members of the craft community to present their stories and to participate in informing the world at large as to who they are and what they have to offer on their tables at the market and beyond. After exchanging laughs and hugs, she gave us a tour of the area where the artists keep their art, and told us fascinating stories of the people that have been there for so many years. We also learned about the process to be able to sell their products at the market, and that it's not as easy as one may think. They have to go to a series of "tests" to prove that their art is handmade, and they are checked regularly to make sure that doesn't change. Pam also explained how, when they are first approved to sell their products, they are not really sure of wether they will find a spot at the market to place their tables and merchandise. They have to be assigned a spot daily, and sometimes, some of the new artists are not able to find a space in the market and so; they have to set up their tent outside. They also have to dismantle everything every single day. It's a tough job! It was truly an honor to be invited to be part of this tradition, and learn more about the artists that work at the Market. That said, I highly encourage you to get your gifts from these artists for Christmas, birthdays, or whatever especial occasion you may celebrate soon. It will not only be completely unique, and beautiful, you will also be supporting many local artists! 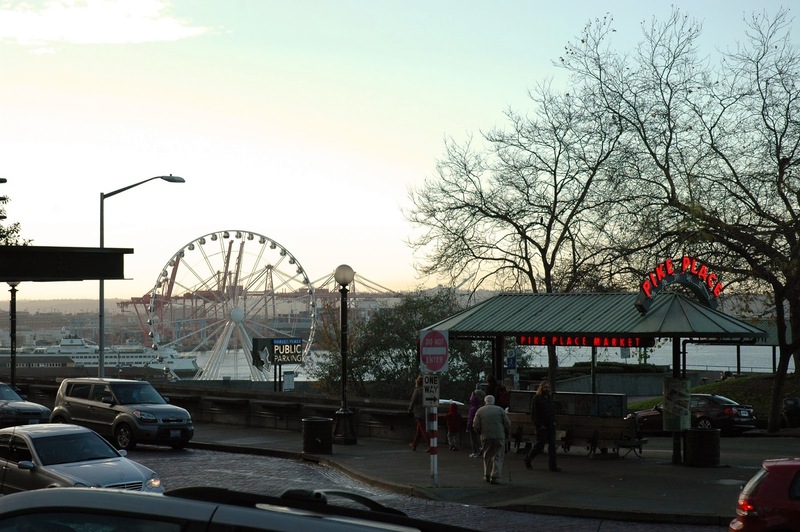 Our view as we were arriving to the Pike Place Market. Pam Carwin in the middle introducing the famous Lori Ness, Northwest Prime Radio DJ. Lori, on the right, introducing us. Group photo. 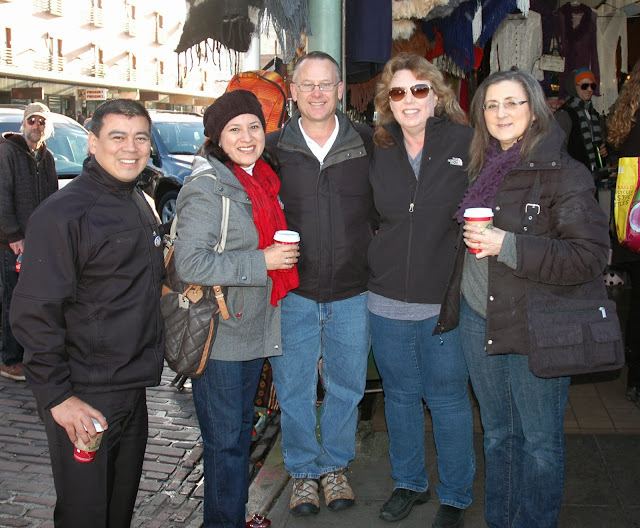 From left to right: Miguel Munoz Lucho, me, Joe, Lori Ness, Pam Corwin. 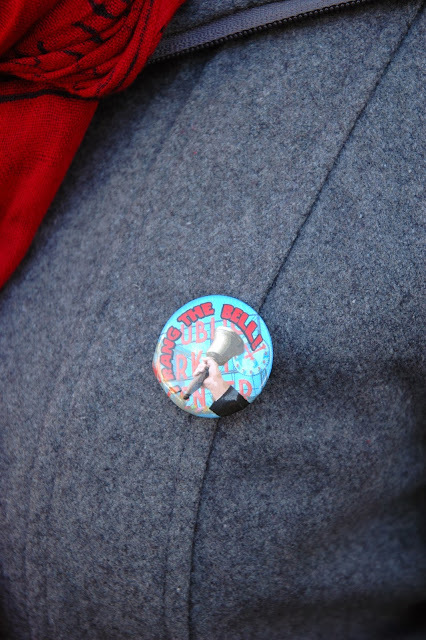 My "I Rang the Bell" pin. We couldn't resist the temptation of reenacting a scene from Sleepless in Seattle.